A burger and soda go together like peanut butter and jelly, but you might want to reach for water with your next meaty meal. You’re probably well aware that sugary drinks aren’t good for you. A burger and soda go together like peanut butter and jelly, but you might want to reach for water with your next meaty meal. You’re probably well aware that sugary drinks aren’t good for you (especially if you’re showing these signs of eating too much sugar), but we’re not here to talk about those extra calories. Sugary drinks could affect your waistline way beyond what the nutrition label would tell you—and they’ll do even more damage if you pair them with the wrong food. Protein-packed meals mean you’re eating foods that help build muscle, which is great! But if you pair them with a sugary drink, you could do more harm than good. Researchers had 27 adults eat four meals: Two had 15 percent protein—one with a sugar-sweetened beverage and the other with a sugar-free drink; the other two were 30 percent protein with the same drink pairings. 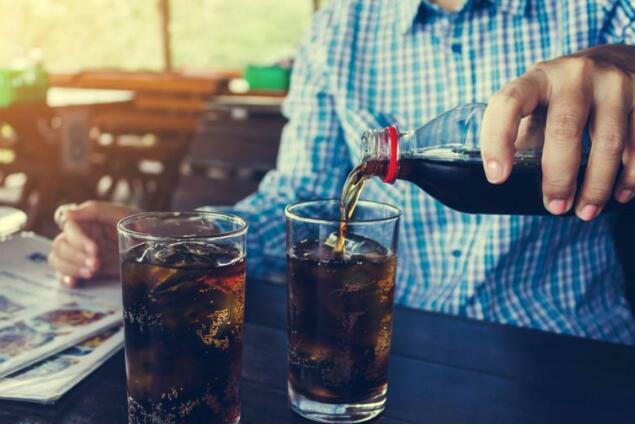 Drinking a sugary beverage with a meal led to lower fat oxidation, the process that starts breaking down fat in the body, according to the study in the journal BMC Nutrition. And the higher-protein meal had an even bigger decrease than the one with less protein. Basically, drinking a sugary beverage with a protein-heavy meal means you’ll burn less fat, unlike these foods that help you burn fat. In fact, a sugary drink could mean more calories even after your cup is empty. The extra calories didn’t do anything to help participants’ hunger—in fact, they led to bigger cravings later on. Getting plenty of protein without the extra sugar cut down on cravings for salty, savory foods. But when the high-protein meal came with a sugary beverage, the appetite for those foods came back. So even though protein is good for you, pairing it with sugar could let those benefits slip away. If you’re starting a day with protein-heavy eggs, don’t make the healthy breakfast mistake of drinking sugary juice; stick with coffee instead. Find out how many cups of coffee will help you live longer (it’s more than you think! ).